PUC Chair Mark Vannoy, shakes hands with the Conservation Law Foundation's Sean Mahoney after PUC granted permit for CMP transmission project. State Public Advocate Barry Hobbins looks on. 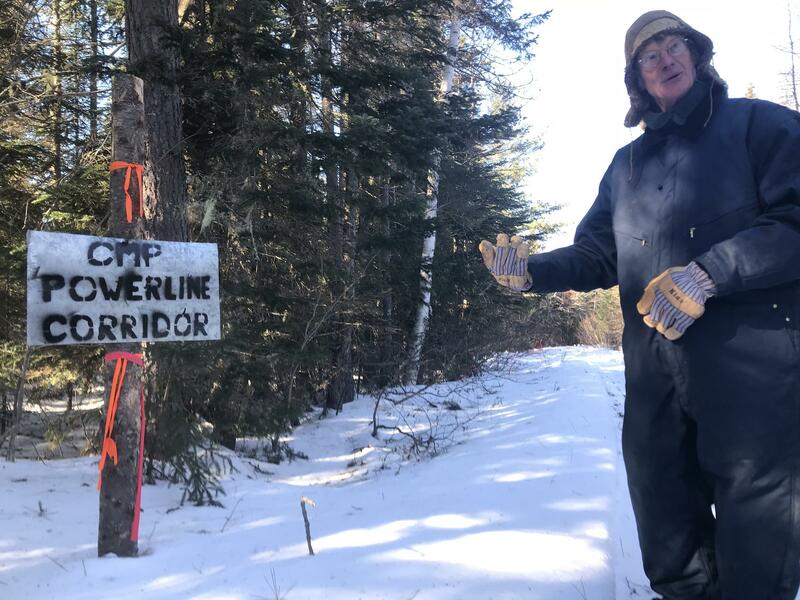 Maine's top energy regulators handed a win to Central Maine Power Thursday in its bid to build a controversial power line through western Maine. The Maine Public Utilities Commission unanimously approved a "Certificate of Convenience and Public Necessity” that CMP needs to move the 145-mile project forward. Commission Chair Mark Vannoy says potential harms of the project are outweighed by its benefits for the state. “When we're looking at the public interest we're looking beyond the local impacts,” Vannoy says. He emphasized that Massachusetts residents would finance the billion-dollar project under a contract mandated by that state's government for enough renewable energy from Canadian dams to power a million homes. That energy influx, he says, would put a brake on electricity prices in Maine, while providing a low-polluting replacement for natural gas and nuclear plants in the region that are due to be retired. And, he says, critics’ claims that it would not produce a net reduction in global greenhouse gas pollution are wrong. "When that incremental capacity is delivered to New England, it's global,” he says. “It's not substituted through other ties. That means there's a greenhouse gas reduction." The decision was based on a recommendation from the Commission's staff of analysts and lawyers, but it flew in the face of condemnation in more than 1,000 comments from Mainers, who testified in person or filed written objections in the case. Many of the opponents are from Somerset and Franklin Counties, who say the power line would cut a permanent scar through 53-mile miles of forest, 150-feet wide, from Caratunk to the Canadian border. "There will be some loss of scenic and recreational value," says commissioner Randall Davis. Davis says he has fished, rafted and hiked in the area, including to Coburn Mountain, which the power line would cross, and he appreciates the residents' concerns. But he added that after hearing pleas from opponents, he made a more meticulous inspection of the area. "I have flown the entire length of the proposed corridor from the Canadian border to Moxie and down to Wyman dam. I appreciate the area... I simply do not see the effects using the extreme terms that are often being used," he says. CMP's proposed transmission line would cross right over the trail Duane Hanson uses to get to his off-the-grid home near the Canadian border. The three member panel, all appointees of former-Gov. Paul LePage, agreed by consensus that CMP should get the permit. "Oh yeah we're thrilled, we're thrilled," says Thorn Dickinson, a vice president at CMP's parent company, Avangrid Networks, which itself is owned by Spanish energy giant Iberdrola. Dickinson says that after 18 months of hearings and filings at the PUC, the company is ready for the next step — permits needed from state environmental regulators. Analysts say that CMP stands to earn $60 million per year from the power line — which is why many environmental groups say the company needs to do more to offset the project's harms. They want the state to require CMP to conserve tens of thousands of acres to mitigate the fragmentation of what is now a largely unfragmented forest. Dickinson says the company is willing to talk. "We understand that any project has adverse impacts,” he says. “That why we carefully sited the project the way we did, and why we've continued to improve the mitigation associated with it and again we are always open minded to additional modifications." CMP won support from an array of business and other interests, including Gov. Janet Mills, after agreeing to a benefits package Commission staff says is worth around $85 million in present-day dollars. Two environmental groups, the Conservation Law Foundation and the Acadia Center, did support the project, attracted by CMP's offer to finance efforts to "decarbonize" the state's economy through direct dollar donations to such efforts and by supporting policies to promote renewable energy in Maine. But other conservation groups, including the state's largest, the Natural Resources Council of Maine (NRCM), have been steadfastly opposed. This handout map from The Nature Conservancy shows the interconnectedness of the forestland in New England and Canada, and the high value of the area where Central Maine Power wants to clear-cut a transmission pathway. Sue Ely is NRCM's lead lawyer in the case. "This is the Public Utilities Commission siding with Central Maine Power's corporate interest over the best interest of the state of Maine and ratepayers in Maine," says Ely. While the stakeholders are turning their attention to the environmental reviews, they are also turning to the statehouse, where lawmakers who oppose the project are working on measures that could stall or even kill it. "There are many more steps to take on this journey," says Representative Seth Berry. Berry, an outspoken critic of CMP, co-chairs the legislatures Energy Committee. He has submitted a bill that would require affirmative votes of support from towns that would host projects such as the transmission line. Several towns have already voted to go on record against the project, but the Commission's decision could force Berry to write an amendment that would make his bill retroactive. Berry says he would be happy to do so. A handful of measures that supporters hope could sink Central Maine Power's proposed 145-mile transmission line through western Maine were up for public hearing in Augusta Wednesday. Legislative action comes just as state energy regulators prepare to rule on a key permit for the project. At a hearing in Augusta Thursday, the Maine Public Utilities Commission (PUC) considered whether to approve a negotiated settlement that Central Maine Power (CMP) is offering in order to build a 145-mile transmission line from Canada through western Maine to deliver power to Massachusetts. The deal has the backing of Governor Janet Mills and the state’s Public Advocate, but environmental groups are split, and several municipalities along the transmission line are also opposed. Debrief: State PUC Recommends Approval Of CMP Transmission Project - What Now? 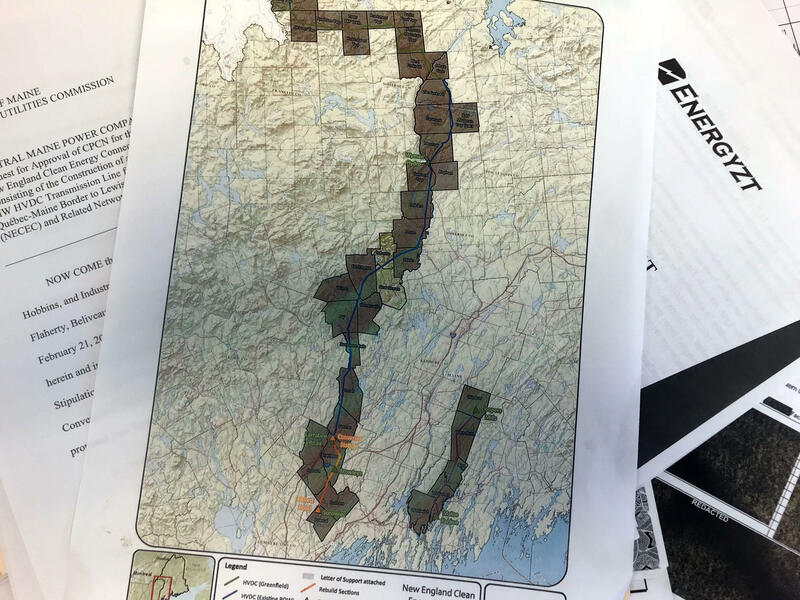 Staff at the Maine Public Utilities Commission last night recommended approval of Central Maine Power’s proposal to build a 145-mile transmission line through western Maine. It’s not a final decision, but, nonetheless, a boost for the project and a blow to its opponents. Maine Public’s Fred Bever joined Jennifer Mitchell on Morning Edition for a first look at the latest development around the controversial plan. A twelfth municipality that could host a new power line proposed by Central Maine Power has voted to oppose the plan. At town meeting Thursday night, Starks residents rejected a motion to support the project, 42-to-14.